Well, our long-awaited camping trip was a bust. It was pouring rain for almost 24 hours straight and just above zero our first night. So cold and damp in that new tent of ours. 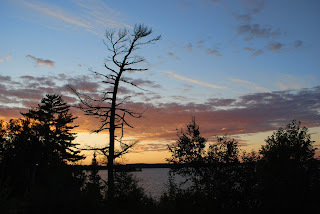 We huddled together under piles of sleeping bags and blankets, but still could see our breath. The next day, rain continued for another 12 hours. We gave up. Packed up in the pouring rain and headed home. We so looked forward to this trip, so did our nieces who were supposed to come out on Friday and spend the weekend with us. We were all disappointed. The torrential rain and frigid temperatures would have made us all sick for sure. There were a few positives, though. The ice cubes in the coolers stayed frozen, as did most of the meat, so nothing was spoiled. A friendly chipmunk visited us and took refuge from the rain and cold in my lap while I sipped coffee underneath our screen tent shelter. 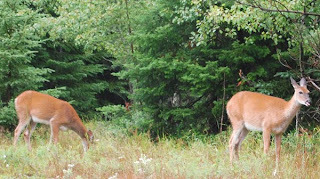 And, a doe and her offspring watched us about 100 feet away while we packed up in the rain, content to graze in the downpour undisturbed, as most campers had already packed up and left hours earlier. This summer has been the pits for weather. Cold, rain and fall temperatures throughout July and August. Leaves on Maple trees are already turning colors, usually happens in October, not August. Very disappointing. We had the family clan over for supper to use up the food we had brought camping. Oh well, we did have a few laughs tonight and enjoyed a good meal. Camping season, if we had one this year, is pretty much over. Almost chilly enough right now to turn on the furnace. No kidding! A risk of frost over night. This is nuts! If there really is global warming going on, it certainly is by-passing us here! We are already in the last full week of the month, and it seems like we've been constantly on the go with new plans, and new stuff. 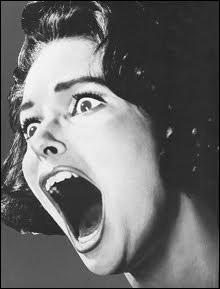 Some of you are on holidays, and may not know what's been going on in the Atomic Zombie world. * Warrior Racing Trike - NEW PLAN! 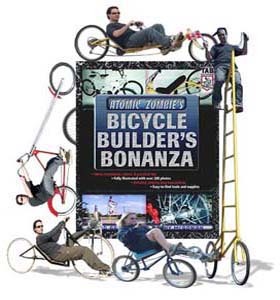 There are 21 more additions to the Atomic Zombie family - choppers, SWB recumbents, lowracers, quads, trikes, tandems and crazy fun bikes. There are now more than 670 entries in the gallery. Keep up the great work, everybody! We keep getting requests to get more stickers and shirts made, but it costs too much for us to get a bunch done and ship out, so we teamed up with Cafe Press to offer a variety of goods - T-shirts, mugs, Sigg water bottles, bumper stickers, decals, BBQ aprons. More product lines will be available within the next two weeks. 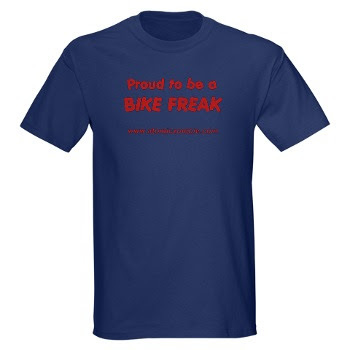 There will also be black shirts and more T-shirts for all of you chopper, tandem, trike, tall bike and electric vehicle folks available in two weeks. We've tried to come up with designs to suit a variety of interests and styles: bike builders and riders, garage hackers, tall bikes, recumbents, choppers, trikes, tandems, electric bikes, etc.Check out what we have so far. We welcome your suggestions. Thanks. Please take a few moments to complete the survey and help us gather feedback to improve the newsletter with content our readers want to see. You can qualify to win a prize! Sorry, it's not a vacation package, money or luxury items, but merely a token of our appreciation for participating. More information on the survey is posted on the Support Forum. To contribute to the monthly newsletter, please contact KoolKat through the Support Forum. Submit your story ideas by the 20th of each month. See you in the forum! Warrior Racing Trike plan now available! Well, it's done, but it's our unfortunate luck that there's a technical issue uploading the dang thing to the store, so we've contacted the technical gurus to find out why. Another sleep, folks, until we can get this situation resolved. Warrior Racing Trike plan - DONE! Hold onto your welders, kids, the plan is finished. Fini. Completed. Final editing takes place tonight. Stay tuned. Tomorrow it will be online. Probably in the afternoon. I know some of you have been anxious for this moment. Just one more sleep, and everything will be right as rain. Above is a small sample of what you will find in the gallery. There are now more than 670 entries in the gallery. Keep up the great work, everybody! The writing continues on the soon-to-be-released Warrior Racing Trike. It's promising to be a big plan, with over 200 photos so far, plus diagrams. Should be done in a day or two. Added some T-shirts in the Atomic Zombie store. There are more colors to choose from, including black, navy blue, military green, red, and grey. 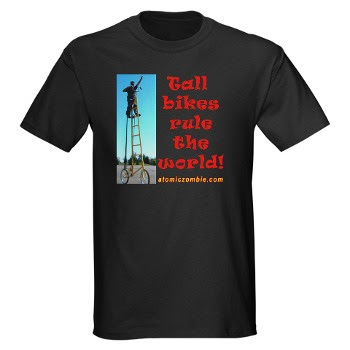 New designs for recumbents, recumbent trikes, bike freaks and tall bikes were added today. And, for all you chopper freaks, T-shirts celebrating chops will be added later this week. 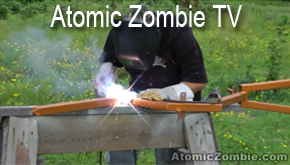 Click here for T-shirts and other gear at the Atomic Zombie store. So far, the project has over 200 pictures. It has taken Brad a couple of days to get them organized and he's writing like a madman. I expect to be editing tonight, with the plan online tomorrow. It's finally a beautiful day out, so maybe will putter around the yard instead of staying inside for the umpteenth day in a row. More product lines will be available within the next two weeks. There will also be black shirts and more T-shirts for all of you chopper, tandem, trike, tall bike and electric vehicle folks available next week. We've tried to come up with designs to suit a variety of interests and styles: bike builders and riders, garage hackers, tall bikes, recumbents, choppers, trikes, tandems, electric bikes, etc. Check out what we have so far and send us your suggestions for products and/or designs/slogans that you'd like. Good thing it's raining and overcast today. Brad has begun the long task of organizing the hundreds of photos to write the plan this weekend. If all goes well, should have it available for download on Monday. Patience, grasshoppers! We know some of you are biting at the bit for this one. All in good time. It's a bit cool outside today, perfect for staying indoors and doing some cleaning, compared to the high humidity for most of this past week. The storm overnight freaked out the dog, and he paced for hours, keeping my awake. Need a few coffees to get me motivated. I see the sun is trying to peek out from behind ominous clouds. Maybe will wait an hour before my walk. Not fun getting caught in a torrential rain storm. Warrior Racing Trike 100% finished! At last the day has come. The Warrior Racing Trike is done. Completely. We took a few glory shots outside after the brakes were added, and tomorrow will be heading out to do videos and more photos. It's a really sweet machine. Lots of unique stuff with this design, but still within reach of most builders to make. We hope to have the download online this weekend. Woo hoo! Time to relax tonight and enjoy some much needed rest. Melissa Brandts and her husband were hiking in Banff National Park in Alberta, Canada and decided to take a portrait of themselves with spectacular Lake Minnewanka in the background. Melissa set up the camera's timer and went back to pose. Meanwhile, attracted by the ticking timer, a Columbian ground squirrel, common in the park, popped up to investigate. Click! "Self-Portrait With Ground Squirrel" was born. Knowing she had struck photo gold, Melissa sent the pic to National Geographic magazine's Your Shot, and photo editor Susan Welchman chose it for her Daily Dozen gallery last week. You can find it in all its furry glory by clicking here. I know, I can hear you saying, "When will it be done? When can I get the download?" Patience, grasshopper, it's almost finished. Priming was done last night, and today the bike will be painted. We expect the download to be available this upcoming weekend. I'm not sure what the seat will look like. Brad is keeping that one under wraps for now. Will keep you posted. It's shaping up to be another hot today; it's about time! The corn has been growing slowly for months. We need some hot temps to ripen tomatoes and keep the corn plants healthy. Hasn't been a great summer for biking with so much rain, cold temps and wind. Maybe we'll have nice temps until late fall. That would be nice change from this disappointing season. It would mean at least another six bike projects finished before winter. Hmmm...keep your fingers crossed. It's bad enough that drivers on streets clash with cyclists regularly. Now, cyclists and e-cyclists are fighting with each other. It's just plain stupid. Granted, I can see other recreation trail users' concerns since electric bikes under Ontario law can travel up to 32 km/hr, much faster than pedal bikes, joggers and walkers. However, the National Capital Commission has not banned e-bikes on recreation trails. Sounds like miscommunication by the NCC and recreational trail ragers. More progress today. Looks like priming tomorrow, maybe painting, too. Got the brakes installed today. Almost done...patience, folks, the grand unveiling will be in two days. 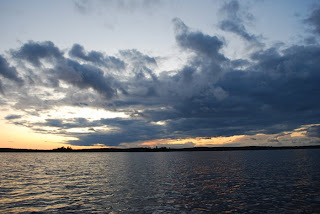 OK, we are well rested from a week at the cottage, although the weather wasn't very good and the fishing was so-so. 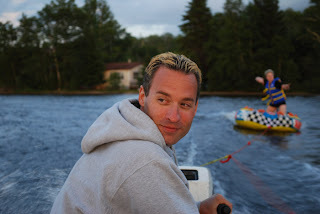 The biggest fish was a 5-lb pickerel (walleye), followed by a 3.5 lb large mouth bass. Good eating! Too bad we wore sweat shirts and pants most of the time due to wind and cold temps. Only went swimming in the lake once since it was so cold. The mosquitoes weren't too bad, though. They probably died off quickly because of the cold temps. We took the LodeRunner 2 and E-Style Electric BMX with us. Had a blast touring around town and rural roads. E-Style was a big hit with the teens. Brad plans to finish up the Warrior this week, including painting. We hope to have the plan done later this week and videos for Warrior, LodeRunner 2 and E-Style Electric BMX this weekend. She died on Saturday, the day we left for the cottage. The obituary was well written, all of the funeral home arrangements were organized months ago. She made sure that everything was taken care of knowing that her husband of nearly 50 years and her family would be too distraught to do all of the planning. She wanted things to be done a certain way, focusing on her life and her happiness, not the pain and suffering she endured for years when cancer took over her life. She was a fighter right until the end. Last week, she was too tired to fight any more. She was ready to go to sleep. I still can't believe she's not here any more. The sun finally came out early this evening after days of rain, overcast skies and intense wind. There's been a chill in the air since we arrived. The water is starting to calm down. The healing has begun, but the memories will always make me smile.